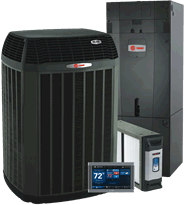 At family-owned Aire Tech Solutions, making our Creston-area customers comfortable isn't just about providing outstanding cooling and heating systems. It's about giving you a pleasant customer experience – from a fast response to your initial call, to a relaxed, face-to-face review of options that make sense for you, to the timely completion of your installation, maintenance or repair project. For a stress-free time from start to finish, trust your air care to Aire Tech.